In the camp there's a man from Edlib, in the north of Syria, who is a good player of the oud, the traditional lute of the Arab world. People gather around and dream away on the sound of the Oud. Ideas recorded it while his roommate is listening, very concentrated. Ideas' cousin is also fleeing now. They WhatsApp regularly. The journey is now different from earlier this year. There are -still- more people. And it's colder. 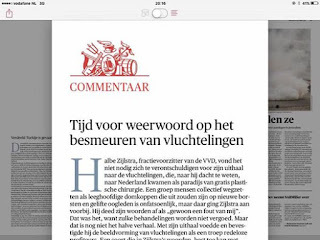 This week, Halbe Zijlstra, the chairman of the Dutch liberal -ruling- party, did his best to depict refugees in the media as non-entities, that can be put in 'container housing with minimum living conditiions and 20 euro's a week'. The NRC Handelsblad editors contribution demands that politicians stop framing refugees as welfare-tourists. Hurah for the NRC, this is a very important message. 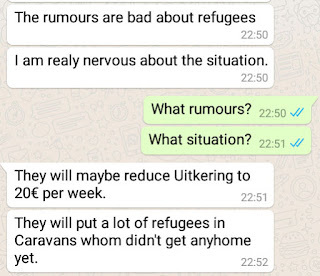 Refugees themselves though are invisible in these discussions. But they read newspapers and are very aware of what's going on. And yes, they do not feel welcome and yes, that depresses them. I urge media and politicians to include refugees in their dabate. 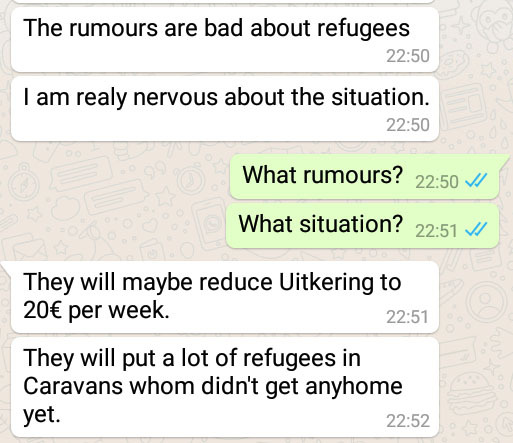 Ideas gets this video via WhatsApp: there are still large groups in inflatable rafts coming to the Greek islands near the Turkish coast. Here they are lining up for food on Chios. 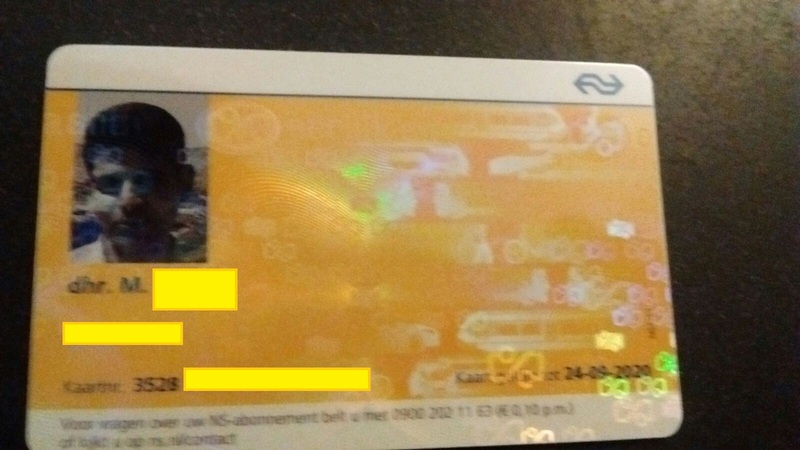 Like many ex pats in the Netherlands, Ideas has trouble to get to know the ins and outs of the OV chipcard, the public transport paying card . Since a week, Ideas has a personal chipcard, that provides him with 40 % discount in the weekends and out of rush hours. The system of the card: checking in, checking out, seems simple enough. But the devil is in the details: how to check in for the fast train to Rotterdam? Do you have to check in separately for the tram? Don't forget to check out. etc. etc. This week Ideas paid at least 10 euro's too much. And he does not feel good about this. How does it work? Whats the difference between a blog, Facebook and a website? Ideas asks. And we both look at the screen. Actually, it is a difficult question. But I do my best to explain. 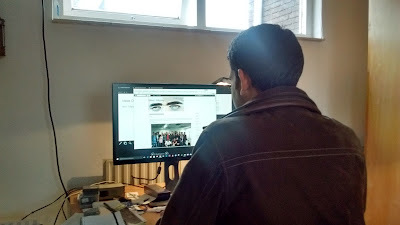 From now on, Ideas will also contribute to the blog. Inshallah, of course.